This Saturday was the wedding of my close friend at which I was to be best man. 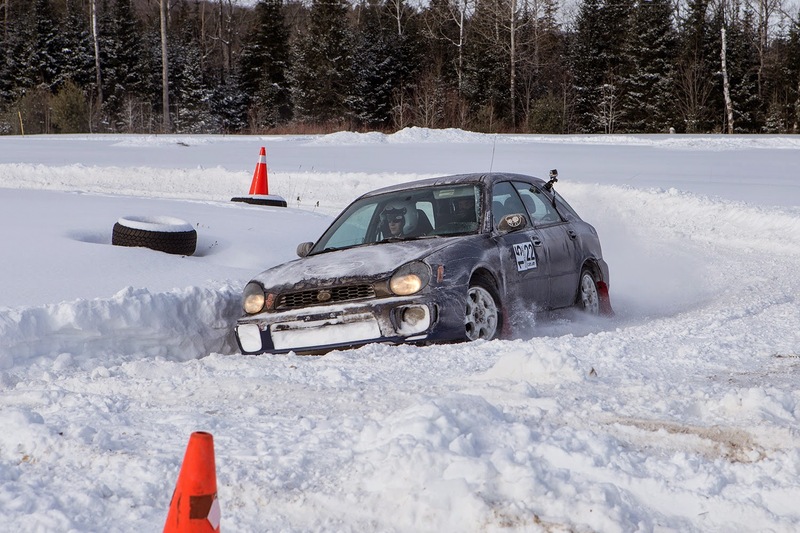 This Sunday was the first MLRC rallycross of the 2015 season. I couldn't possibly say no to either, so I've decided that I'll attend both despite knowing that I'll be up all night on Saturday and had to be in Bancroft at 9am on Sunday. Sleep is overrated anyways. The wedding went on well into the night and by the time I got home it was so late I questioned whether there was any point in going to bed at all. By the time my head hit the pillow it was 3am. We were to leave from my house at 5:30, so the alarm was set for 5. Surprisingly at the first hint of the alarm I hopped up and got ready in record time. 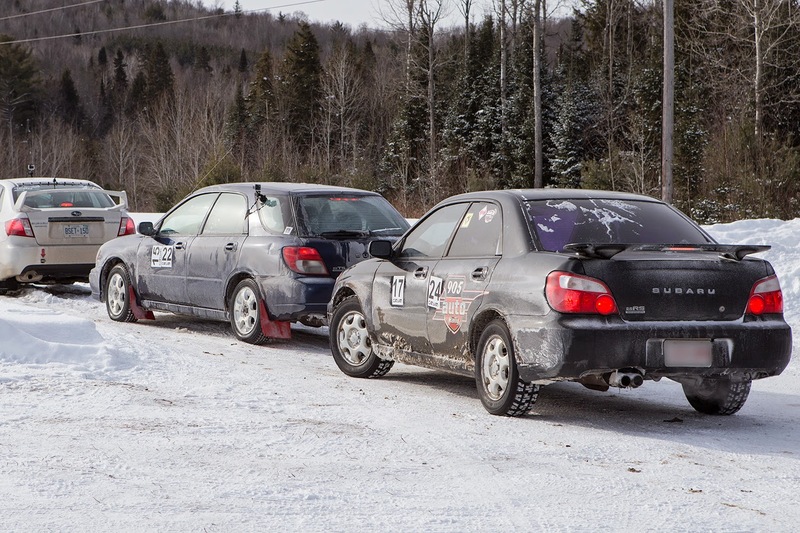 Outside I was greeted by a duet of boxer engines (our rally wagon and another Impreza of a friend who came along to watch), and we were on our way shortly. We were looking forward to this event for a while because it was finally time to try out our new tires, and see if we made the right choice in the type and size of the tire. Despite them being regular winter tires we decided not to wear them on the street, so we brought them along and put them on before the start of the race. Brand new Blizzaks ready for battle. So how did it feel? Wow. With our old tires it was all about slow in, fast out. 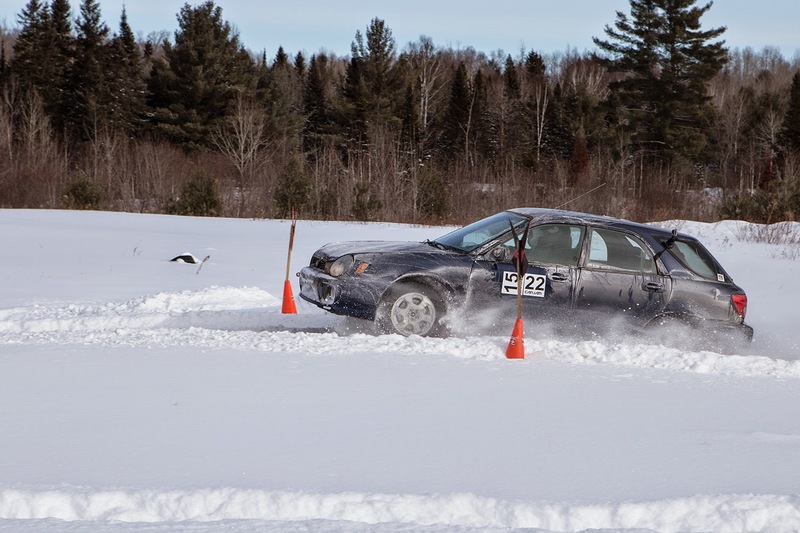 Go into a corner a tiny bit too hot and you're understeering straight off into the snowbank with no chance of recovery. It was outright scary. With the new tires - I got to the first corner and nearly wet myself as the front end dove into the corner and the back stepped out pulling a massive all wheel drift all the way through. It felt almost as predictable as a RWD car, but much much faster. 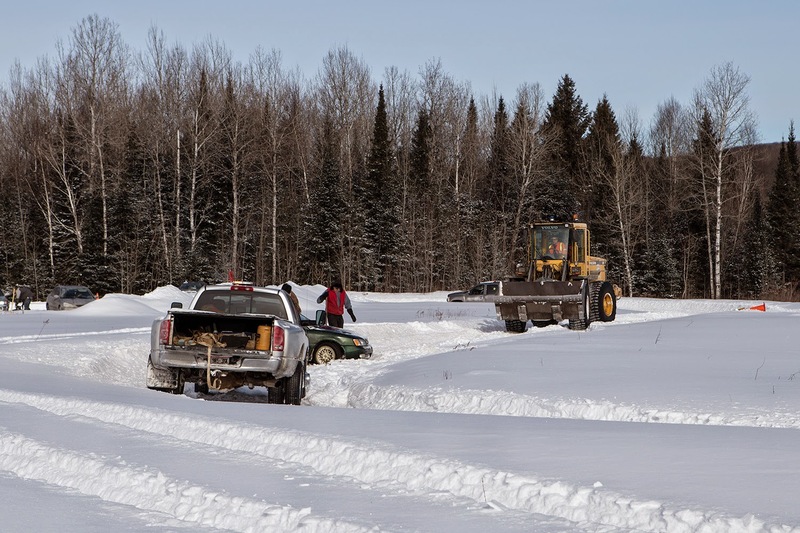 Only when the course got very beat up (or we got way too enthusiastic) did we start running wide into the snowbanks. But even then we never got stuck. I understand two Subarus having matching mudflaps, but this? 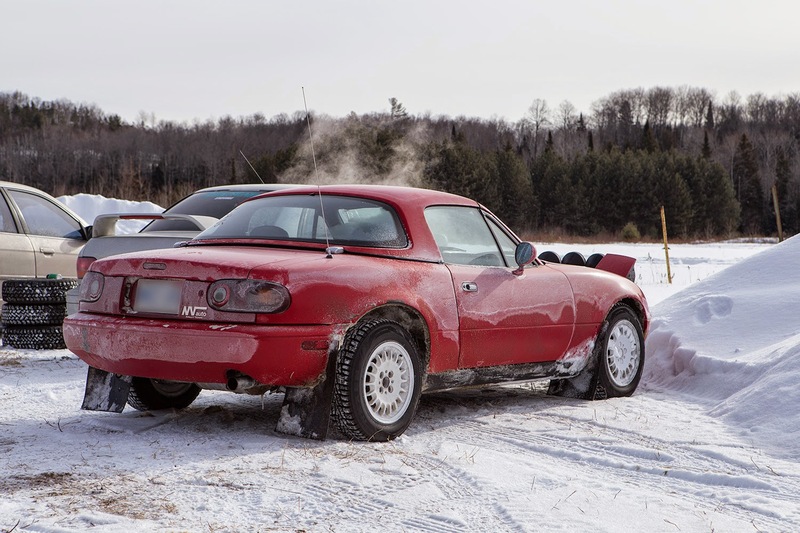 Miata is always the answer. Even when you want to go rallying. Funny thing is - last season we were on crappy street winter tires, while our competition seemed to be on good street winter tires. 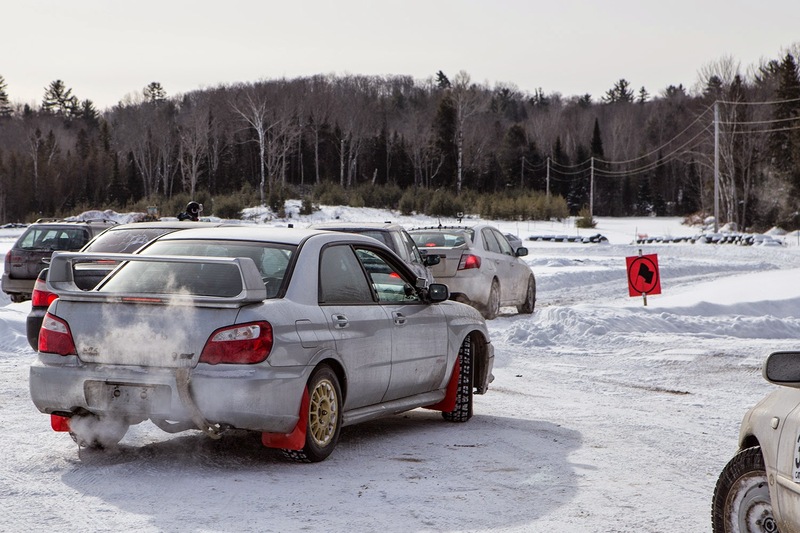 This year we got ourselves one of the best street winter tires, but our competition was now running proper rally tires. Damn. 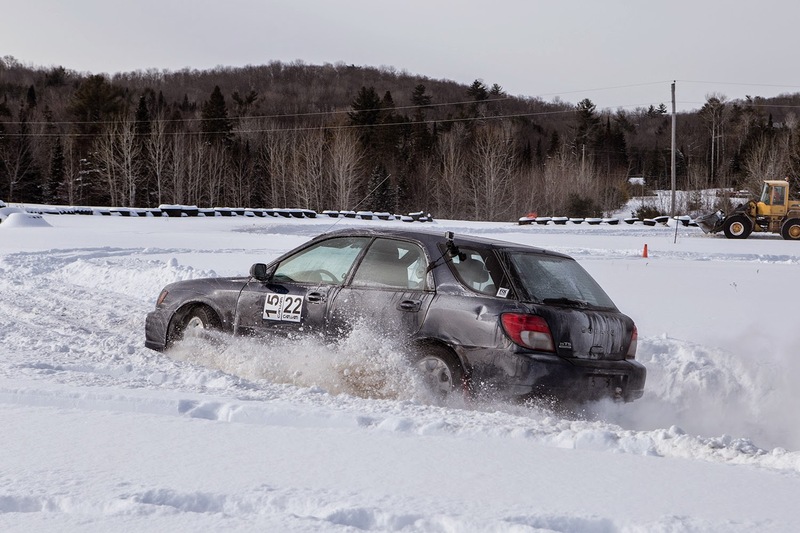 In fact, the 1st place in our class (Class 3) went to a GD running proper rally snow tires. That's alright, we were pretty stoked ending up 2nd and 3rd in class. Class 3 winner staged behind us. Notice the difference in tires! 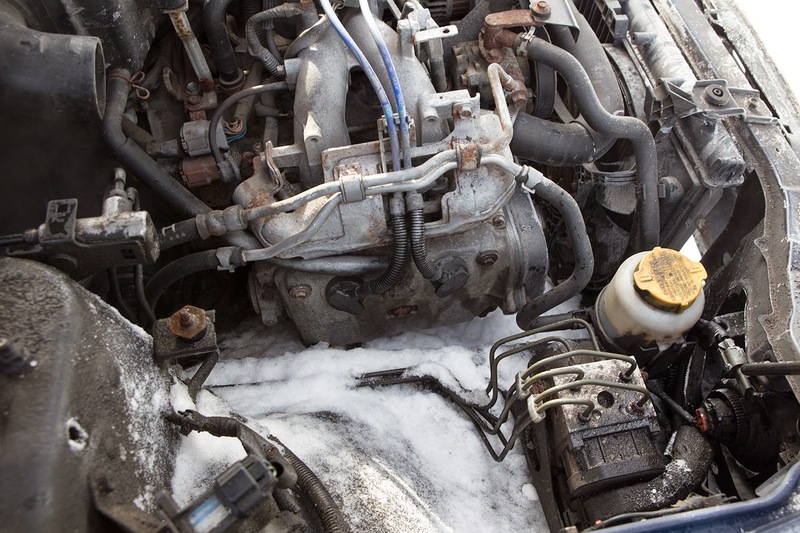 ...and your brakes need to be cleaned with a snow brush. It's decided - we're clinically insane!